I'm sure many of you have had experiences with the Better Business Bureau ... the ineffective quasi government agency that claims to be in existence for consumer protection. Recently, I had reported two businesses to the BBB. 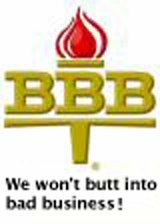 Large corporations know that they must respond to all BBB action, regardless of the merit of the consumer's claim. They also know they can't float the terms "litigation" or "lawsuit" around lightly. Well, in case you didn't know this about a bad company you may be dealing with, the only thing that company has to do to avoid a negative report on their BBB record is to say there is pending litigation concerning the issue at hand ... the BBB will claim they cannot issue a report or even follow up at that time. You will never be able to report the business to the BBB. * You you go to www.bbb.org and fill out an online complaint for a business. * BBB forwards report to business and gives them 15 days to respond. * Bad business gets an attorney to draft a letter that says the case is pending litigation. * BBB sends you back notice that "the issue" you have reported is outside their purview. The BBB is one of the least effective ways to report businesses. Probably the best way is to report them to the local Chamber of Commerce, to National Consumer Affairs, and to the FTC fraud divison. If this happens to you ... send notice to the BBB that you would like a case number for the litigation ... otherwise, you would like the BBB to help mediate the situation. This will force them to respond to the action further. Of course, mileage varies from bureau to bureau. The key is to resolve the situation amicably ... but if no resolution can be made through the report, which rarely happens ... you at least want a strike against the business's record. Any of these tactics will usually exclude the business from being located, therefore not allowing you to make a complete report. But honestly, the newest tool for consumers is the internet ... I hope the site you are reading will assist you in your daily quest to find honest, professional businesses.